All-purpose cleaner cuts through dirt and grime without leaving sticky residue. Drop & Mop is an Earth-Friendly approach to floor cleaning. Its intelligent product design reduces shipping weight and therefore greatly reduces the carbon footprint compared to other water based cleaners.Just Drop & Mop...Water activates its powerful cleaning action! •Cleans most stains and eliminates odors with one application. All-purpose cleaner cuts through dirt and grime without leaving sticky residue. Drop & Mop is an Earth-Friendly approach to floor cleaning. Its intelligent product design reduces shipping weight and therefore greatly reduces the carbon footprint compared to other water based cleaners. Just Drop & Mop...Water activates its powerful cleaning action! •Mixes up fresh every time you mop for maximum power •Cuts through dirt & grease with ease •Easily lifts set-in grout stains •Includes powerful bleaching action •Concentrated product reduces waste & pollution •Time-released formula provides a Clean & Fresh scent. Works Great on These Surfaces: Tile, Porcelain, Ceramic, Terrazzo, Marble, Granite, Sealed Concrete (Not for use on wood, laminate, or carpet/rugs). How long does the stain cleaning power of FiZZiON last? 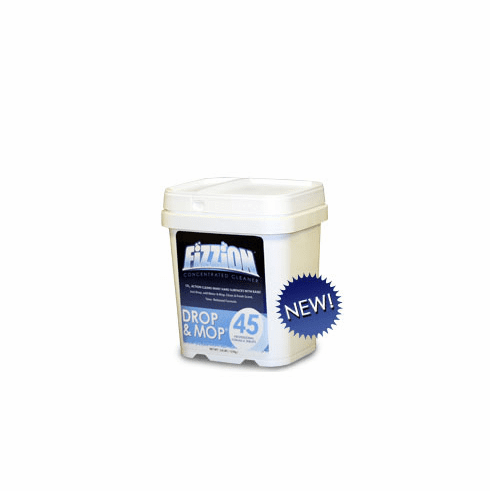 Fizzion mixes up fresh when you need it and keeps its cleaning power for a year or more. When your bottle is empty, just mix up your next batch. You save money, time, water, and Fizzion is better for our environment.